When I was in sixth form I studied Psychology, and one of the most interesting aspects of the course was the module on sleep. It turns out that no one really knows why we sleep, what purpose it serves, what dreams are, why they happen, or what benefit sleep has. For something so ubiquitous in our lives, it seems insane to think that we have never worked out what it’s for. In this novel, we explore some of the more unusual aspects of what is already a very unusual scenario. Ashdown is a house for students. They come and go, but the bonds they form are deep and long-lasting. In one room is the narcoleptic Sarah, who has such vivid dreams that she is convinced that they happened for real, getting her into trouble with others, not least housemate Robert, who loves Sarah deeply and will apparently stop at nothing to win her love. Elsewhere in the house is Terry requires fourteen hours of sleep a night, and there’s also Gregory, a psychology student who aspires to greatness. Twelve years later, Ashdown is now a sleep clinic, where Dr Gregory Dudden now studies and treats people who are struggling with narcolepsy, insomnia, sleeptalking, sleepwalking and a whole host of other conditions. But he’s not the only one that has returned, and soon it seems that these four are destined to be reunited at the house where they grew up, only to find that things are not quite as they were. Chapters alternate between their student days, and a time over a decade later where they’ve all grown up and, for a time, lost contact with one another. But secrets have lain dormant for years, and soon their lives are interconnected once more, whether they want them to be or not. I feared when the novel began that it was going to be another one of those novels where an author attempts to show off his intelligence through the well-read, political, culturally-aware student characters. You know the sort. While there is a little of this from one character in particular (two if you count a character who has an encyclopedic knowledge of film), I was pleasantly surprised to find that this wasn’t going to just be world-weary students sitting round like they’d got everything figured out. Like all good books, it treads that fine like of being very funny, as well as breaking your heart a tiny bit too, all while making you want to turn the page and devour the next chapter. Gregory Dudden is entirely unsympathetic, a scientist with a one-track-mind and an obsession that has got out of hand and led him down a very dark path indeed. Apparently disrespected by fellow students and then later by his staff, he seems to care little about what people actually think of him and so hasn’t realised what an insufferable, unpleasant, smug creep he is. Despite dating Sarah presumably because he was attracted to her, it later transpires he mostly bothers with her so he can study her condition, as well as indulge in a sexual game that only he enjoys that involves pressing down on her eyelids. This act scars her for life and has a strong impact on her future relationships and psychology. The other characters are more pleasant, although all flawed in their own ways. Terry has gone from being someone who needs a lot of sleep to an insomniac, and like Gregory, has an obsession that has consumed much of his life, although he at least seems to be handling it slightly better. Sarah is perhaps the least flawed character, but even she seems able to act in spite and not really think through what she’s doing. Robert is kind, but needy and can’t accept that Sarah won’t ever love him. Her relationship with him at university has a huge impact on his future and his life is changed forever by her vivid dreams. The novel does seem to rely rather heavily on coincidence, and a small cast of characters keep overlapping one another and finding themselves magnetically drawn to others who have links to their pasts and yet, somehow, it works. It makes sense. Besides, I can’t complain about that. My own novel relies extensively on coincidence for the later plot to work. So despite this minor niggle, I really enjoyed the story. The characters feel well-rounded and when it ended I found myself wishing that there was more. The ending is somehow bittersweet, and you can’t claim happy endings for everyone, but there’s definitely a sense of hope there. A dream, rather than a nightmare. I’ve covered Malcolm Gladwell on this blog before, but his books are continually interesting, so it was no real surprise that he’s returned. Fittingly, although this book has sat on my shelf for a few months, I chose to read it on the spur of the moment – it just seemed right. This is basically what Blink is all about; the split-second calls we make and how we know things before we really know them. I’ll try and explain. This is a book about things that happen in the blink of an eye. Without realising it, we’re all making judgments about people and things around us. While we do sometimes come to understand whatever snap decision we’ve made, sometimes we don’t. In this book we meet historians who know just with a glance that an ancient Greek statue is a fake, a marriage counsellor who can tell with 90% accuracy whether a couple will divorce by just watching ten seconds of them talking about something other than the marriage, and why the fact that Warren Harding was tall and looked like a leader led to one of the worst presidents in American history. It’s a continually interesting read, dealing with psychology so ingrained within ourselves that we barely understand it. For example, classical orchestras used to have barely any women in them, and now the split is about 50/50 for the simple change that auditions now take place behind a screen so listeners can judge only by sound and not by appearance. All of this led to the stark realisation than orchestras were sexist, something that none had ever claimed to be. The sensitive issue of race is handled too, explaining that police officers seem to make more negative snap judgments about black people than white, something that seems obvious when you look at the news some days. There’s even an experiment that explains why Pepsi will nearly always win a taste test, yet Coca Cola is still more popular, and how it’s actually a lot harder than you think to tell the two apart, despite what die-hard fizzy drink fans say. Gladwell has a background in journalism rather than psychology or science, which allows him to give us interesting information via compelling and engaging stories that show the phenomena he’s discussing in action. He never seems to guide you into his way of thinking, but just presents the evidence and lets that speak for itself. Going into detail on any more of the stories here would only ruin their impact. Suffice to say, that if you’ve ever wondered whether your gut feelings are worth listening to, then this book is for you. Sticks and stones may break bones, but words kill. I’ve always considered myself rather persuasive, which is lucky because in my jobs both as a salesman and a writer, that’s a pretty essential quality to have. I’m not saying I could make someone rob a bank, but I can make them buy something they didn’t know they needed. 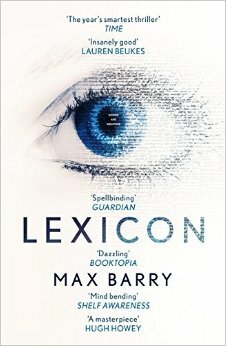 However, when it comes to persuasion, the characters in Lexicon are something else. The story opens with Wil Parke being kidnapped from an airport in Portland, and the first chapter explodes by with murder, destruction, escape, capture and persuasion in good measure. The men who have taken him want him for something, but Wil has absolutely no idea what it is, but it soon becomes clear that without Wil in tow, the men are failing their job and there is a danger on the way. The story then changes and focuses on Emily Ruff, a down-and-out homeless teenager who has nothing but the bag on her back and a knack for tricking tourists into playing cards with her and taking all their money. She finds herself approached by a man in a cheap suit who claims that he can offer her an outstanding future of great promise. There exists a school, known just as the Academy, that will train her to better use her powers of persuasion. It turns out, you see, that there are a finite number of personalities available to people and when you can work out someone’s segment, you can speak a few select words and gain complete control over them. Wil’s story continues as he is held captive by his kidnapper, Eliot, and Wil tries to make sense of the situation around him. Meanwhile Emily begins studying at the Academy and honing her skills. But there is more to it than this. Somewhere in Australia there is a town called Broken Hill, and there is a word there that should never have got out. It kills anyone who sees it, and someone needs to go and get it out of there and take it somewhere safe before it can do any further damage. In this excellent and very fast-paced thriller, linguistics and psychology tie themselves together to show that anyone is capable of being controlled if you just know what you’re doing. It expounds many ideas about how this is going on in our world as it is, most obvious with things such as the Internet, which tailors its adverts, links and stories to show you what you want to see and buries the rest. You may think you have free will, but how many of your decisions are entirely your own? The novel is telling one story, but jumps around at different points along the way. It quickly becomes apparent that the two main stories, those of Wil and Emily, are not happening at the same time, but it takes a while to work out which one comes first and what the consequences of that are. One of the twists I got a long time before it was revealed, but one remained hidden from me until I slapped my forehead and realised I’d been an absolute dunce. I like a book that sets the world up as the one we know and then just tweaks a single detail, such as this ability to fully control people simply because of the right words. It’s long been accepted that words have power, any reader and writer worth their salt knows that, but this turns it up to eleven and shows what we might just be capable of. There are a lot of references to the Tower of Babel and general discussions on evolution of language and why exactly it’s so powerful. My favourite touch is that all the characters with these persuasive abilities are known as “poets” and each one adopts the name of a famous writer, meaning we get characters called Virginia Woolf, T S Eliot, W B Yeats, Sylvia Plath, Charlotte Bronte and Margaret Atwood, among others. Alright, so the ending didn’t quite stack up the way I’d hoped and a couple of things remain unexplained, but a lot of thought has gone into this world and, frankly, I can’t think how I would have ended it, or how indeed I expected it to end. It’s a terrifying book in some ways because we’re all so convinced that we’re acting out our own desires, and we think we project a certain version of ourselves to the world, but there’s no way we can really know if any of it is our own decision. Were I a poet, I would be able to persuade you to read this book with just a few words, but I’m not, so hopefully this review will have done enough. I first encountered the writings of Malcolm Gladwell early in 2011 when I read The Tipping Point, a book about what causes ideas and trends to go from being small to suddenly taking over the world. I loved his style and while he’s talking about big sociological ideas, it was done in an unencumbering, relaxed style. He’s writing non-fiction, but he’s a good storyteller. I finally decided that I had to read him again, because I love a bit of pop-sci, and that led me to Outliers. This is the story of what makes people successful, the outliers who did better than the average. As a society, we look at the people who have done so well and talk about how lucky they are, and in an overwhelming number of cases, we (and the people themselves) go on about how they pull themselves up from nothing and did it all by themselves. However, this book turns that on its head and shows that, far from doing it alone, any successful person needs the help of other people. But there’s more to it than that, even. Sometimes being successful is just being in the right place at the right time. There are probably millions more people capable of being huge successes than currently are, but what exactly is it that causes some to fly high and others to crash and burn? 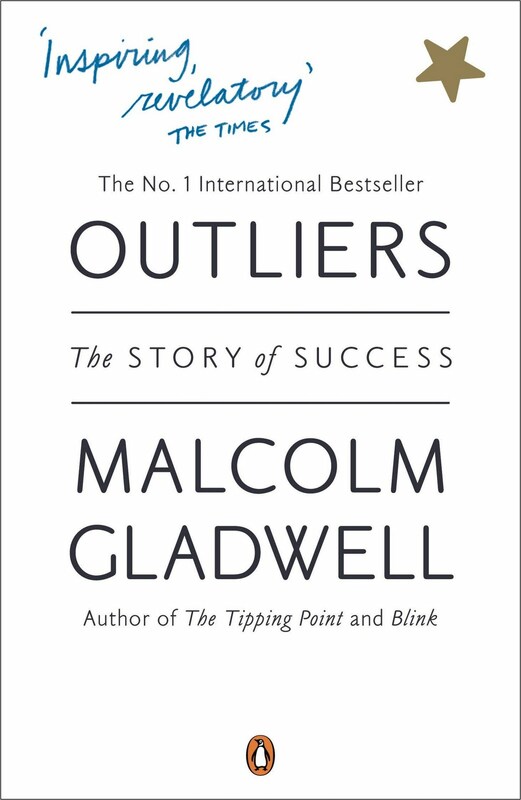 There are numerous topics of conversation going on in this book, as Gladwell studies various people and looks at why they became so successful. He asks why all the best lawyers seem to be Jewish, why the best hockey players in Canada are all born in January, why a Korean airline was having far more crashes than the average, and how come the two most successful software engineers in history – Bill Gates and Steve Jobs – were both born in 1955. There is luck to some of this, of course, but there also seems to be much about taking offered up opportunities. Certainly, he doesn’t argue that these people don’t work hard – he expands on the theory that anyone can be an expert in anything after 10,000 hours of practice – but he notes that there are more factors than just that involved. It is, he explains, often as much about background than it is about personality. It’s a very engaging read, and quite easy. Above all, however, it’s entertaining and smart. The studies are interesting – Gladwell shows, for example, the exact reason why Asians are better at maths than Westeners – and each one shows a different aspect of what we know as success. As others have also pointed out, it’s also somewhat autobiographical, the last chapter in particular explaining how Gladwell came to be who he is, thanks to the opportunities and background cultures of his parents and grandparents. This is definitely a book that will make you think, and hopefully make you smile. It might make you wonder how different your own life could have been if a certain something in your past hadn’t happened. Within these pages are documentations of the singular event that caused the Beatles to become megastars, and led to Oppenheimer leading the team that developed the atomic bomb. While you certainly do still have to put the work in, sometimes the only way to be sure of success is to have the right background. And if you don’t believe that, read this and see if it changes your mind.